Existing evidence for the prospective association of vitamin D status with type 2 diabetes (T2D) is focused almost exclusively on circulating total 25-hydroxyvitamin D [25(OH)D] without distinction between its subtypes: non-epimeric and epimeric 25(OH)D3 stereoisomers; and 25(OH)D2, the minor component of 25(OH)D. We aimed to investigate the prospective associations of circulating levels of the sum and each of these three metabolites with incident T2D. This analysis in the EPIC-InterAct case-cohort study for T2D included 9671 incident T2D cases and 13562 subcohort members. Plasma vitamin D metabolites were quantified by liquid-chromatography mass-spectrometry. We used multivariable Prentice-weighted Cox regression to estimate hazard ratios (HRs) of T2D for each metabolite. Analyses were performed separately within country, and estimates combined across countries using random-effects meta-analysis. The mean concentrations (standard deviation) of total 25(OH)D, non-epimeric 25(OH)D3, epimeric 25(OH)D3 and 25(OH)D2 were 41.1 (17.2), 40.7 (17.3), 2.13 (1.31), and 8.16 (6.52) nmol/L, respectively. Plasma total 25(OH)D and non-epimeric 25(OH)D3 were inversely associated with incident T2D [multivariable-adjusted HR per 1-SD=0.81 (95%CI: 0.77, 0.86) for both variables], while epimeric 25(OH)D3 was positively associated: per 1-SD HR=1.16 (1.09, 1.25). There was no statistically significant association with T2D for 25(OH)D2 [per 1-SD HR=0.94 (0.76, 1.18)]. 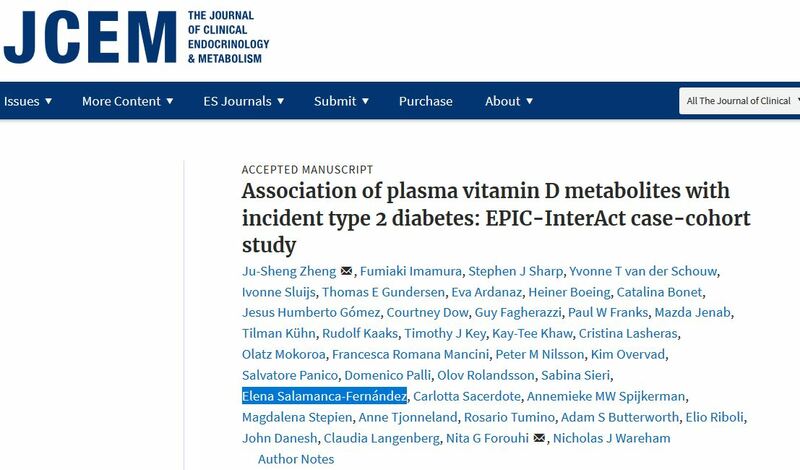 Plasma non-epimeric 25(OH)D3 was inversely associated with incident T2D, consistent with it being the major metabolite contributing to total 25(OH)D. The positive association of the epimeric form of 25(OH)D3 with incident T2D provides novel information to assess the biological relevance of vitamin D epimerization and vitamin D subtypes in diabetes etiology.